The Seven Five – In 1980′s Brooklyn, the most dangerous gangsters were New York City Cops. 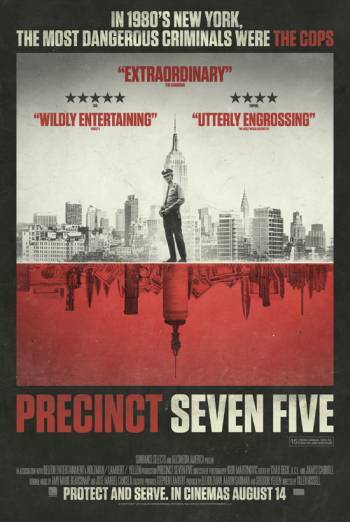 The Seven Five (Precinct Seven Five) is the gripping documentary of a group of police officers in New York City’s 75th precinct. This group was lead by Michael Dowd and he worked both sides of criminal activities in New York for almost a decade. Ken Uerell was his partner who was reluctant at first but finally joined in with Mike. Mike approached local drug dealers to provide information for a weekly payment. Internal Affairs had nothing because no cop was going to “rat” on another cop. The cops don’t even slow down when the 77th precinct has a group of cops busted. Mike Dowd believes the last thing New York wants is another precinct to go through the same thing, so he continues his criminal ways. The best part of this documentary is hearing from the actual people. It gives you a real sense of how crazy the times were. Directors’ Previous Movies: Under The Same Moon, Girl In Progress. If you liked this try: The Summit, Erin Brockovich, We Are Marshall.